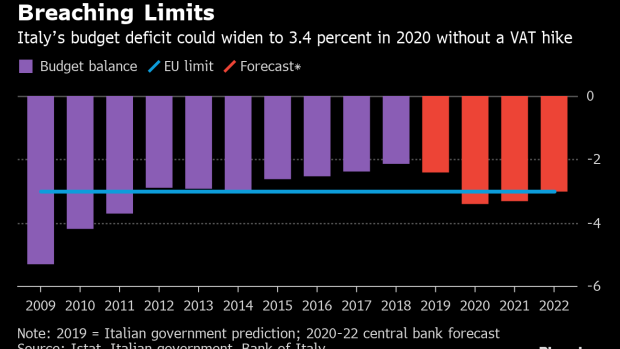 (Bloomberg) -- The chief economist at the Bank of Italy said the country’s budget deficit could widen to 3.4 percent in 2020 if the government doesn’t increase value-added tax, a red line for the populist coalition in Rome. The higher deficit figure would be in breach of a European Union limit, setting the stage for a new conflict between Rome and Brussels. The Italian coalition said last week it’s targeting a deficit at 2.4 percent this year, compared with the 2.04 percent it agreed on with the EU at the end of 2018, following a tense round of recriminations and brinkmanship. A government move to eliminate the current automatic hike in VAT would see a much wider budget gap, the economist, Eugenio Gaiotti, told lawmakers in parliament Tuesday. It would be 3.3 percent in 2021 and 3 percent – the EU limit -- in 2022. The upward revision was driven by a lower growth forecast for this year, with gross domestic product seen rising just 0.1 percent, down from a previous estimate of 1 percent, according to the government’s new economic and financial outlook. Ministers in the fractious League-Five Star Movement coalition have also clashed in recent days over the prospect of raising VAT, which could erode the electorate bases of both parties in power, the business-friendly League and the anti-establishment Five Star Movement. While Finance Minister Giovanni Tria has warned that ambitious budget measures can’t be financed without raising taxes on consumption, Prime Minister Giuseppe Conte and deputies Matteo Salvini and Luigi Di Maio, who effectively run the government, have ruled out any increase or so-called corrective measures for the 2019 budget. --With assistance from Giovanni Salzano and Zoe Schneeweiss.